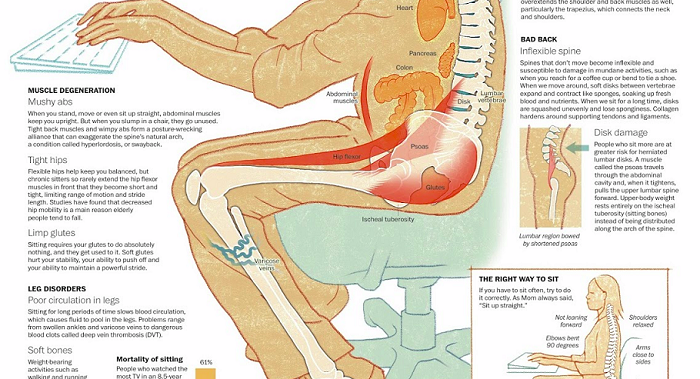 Most adults spend 70% or more of their waking hours sitting, and are unknowingly subjecting themselves to a slow death. 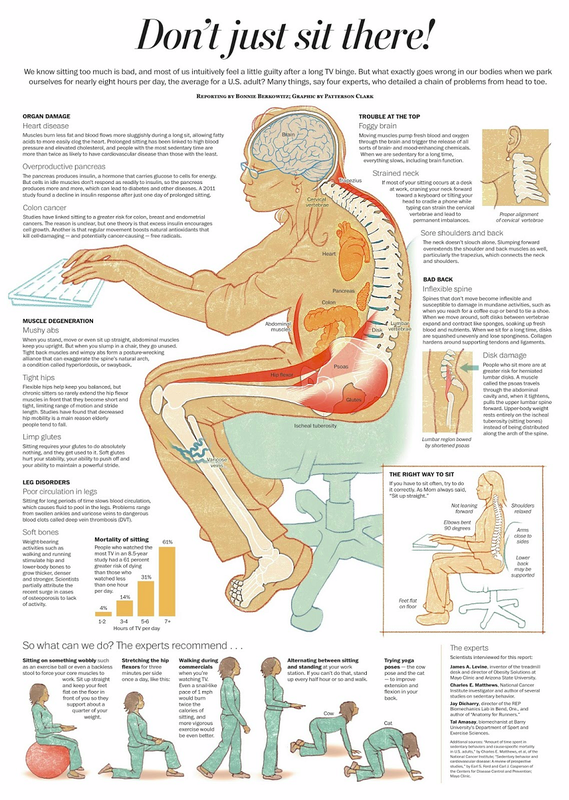 Excessive sitting can lead to problems with posture, poor cardiovascular health, and sleep problems due to an imbalance of dopamines. All of these can lead to more serious health issues. Experts have released a detailed info graphic presented here below, giving you all the information you need about sitting for long periods of time. Every day more and more materials are uncovered from different sources linking deadly issues with excessive sitting, and a sedentary lifestyle. - James A. Levine, inventor of the treadmill desk and director of Obesity Solutions at Mayo Clinic and Arizona State University. - Charles E. Matthews, National Cancer Institute investigator and author of several studies on sedentary behavior. - Tal Amasay, biomechanist at Barry University’s Department of Sport and Exercise Sciences. In addition to limiting your sitting as much as you possibly can, experts recommend challenging yourself to walk 10,000 steps per day. This is over and above a regular fitness program and standing up during work. We encourage you to start thinking about how you can get more physical movement into your life, each and every hour of your waking day.